NFC has seen renewed hope in the U.S. in recent months because Apple and Google are making moves toward mobile payments. Google has already launched the Nexus S, its second try at its own mobile handset, which ships with an NFC chip. However, because security technology is not yet ironed out, consumers that buy a Nexus S today could really only interact with ads, such as tapping a phone to a poster to launch a website. Apple is also expected to announce a new iPhone with an embedded chip this summer. With the hardware in place, merchants will then have to follow suit with technology at registers to accept mobile payments. Apple could also route payments through iTunes, where it already has millions of U.S. credit cards on file. Starbucks has pioneered mobile payments and supports what’s likely the largest-scale program in the country, even without NFC. Customers can show baristas a barcode in their Starbucks app, built by developer mFoundry, to purchase coffee without a wallet at the coffee chain’s thousands of locations. For the coffee chain, it was a way to build loyalty and usage of its Starbucks Card. “With mobile payment, the Starbucks Card platform further elevates the customer experience by delivering convenience, rewarding loyalty and continuing to build an emotional connection with our customers,” said Brady Brewer, VP-Starbucks Card and Brand Loyalty. 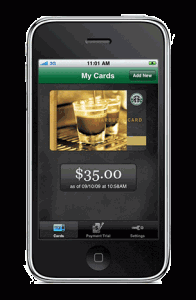 Beyond Starbucks, when will mobile payments arrive in the U.S.? We’ll see pilot programs late this year and they’ll gain steam in 2012, said Drew Sievers, CEO and co-founder of mFoundry. Major U.S. wireless carriers Verizon, AT&T and T-Mobile have teamed up with Discover card and Barclay’s bank to create a U.S. mobile payments system called Isis. Beyond payments, the system is also angling to replace physical rewards cards, coupons and transit tickets and serve up deals and offers based on user preferences. “They are trying to create a phone wallet that competes with Visa, MasterCard and American Express,” he said. OK, it’s kind of cool if consumers start paying for things with their phones. But why should marketers care?